It was zero degrees and there was snow on the ground when volunteers began gathering at 8am in Dubarry Park last Thursday morning, for the countdown to the Irish senior and U20 rugby squads open training session. However, apart from one short hailstone shower, favourable sunny weather conditions prevailed for what was a hugely successful and excellently organised event. Thousands of fans flocked to the Athlone venue, where they witnessed the Ireland senior and U20 squads go through their paces. The forward planning and hard work put in by the host Buccaneers club was evident on the day, with everything going smoothly for the sold out session. 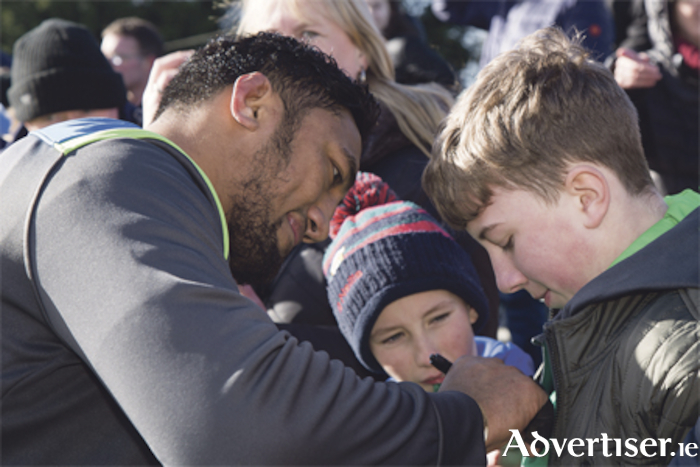 The enforced absence through injury of local hero Robbie Henshaw could not dampen the enthusiasm of the mainly young attendance, who were given lots of time at the end of the session to get autographs and take selfies with the Ireland rugby stars. At the press conference in the Lower Deck, Ireland head coach Joe Schmidt was glowing in his praise for the facilities at the club and the welcome he and the players received. He also highlighted “the enthusiasm and spirit of the fans at Dubarry Park”. Conor Murray, Bundee Akee, Tadhg Furlong, Peter O’Mahony, Rory Best and Jonathan Sexton were the main attractions for the fans, as was U20 forwards coach, Paul O’Connell. Sexton and skipper Best were the last players to leave the pitch, and the iconic out-half really made the day for one little girl named Ava, when he gave her his Ireland beanie hat after posing for a last round of photographs. Buccaneers RFC has thanked all who attended on the day, as well as the IRFU and Joe Schmidt for holding the session in Athlone. The club expressed further appreciation to all the Ireland players who took part, and to the numerous volunteers who helped out on the day, giving their time to ensure that everyone saw the club at its very best.